Craig resident Nancy Roberts has been documenting the wild horse herd at Sand Wash Basin since 2009. 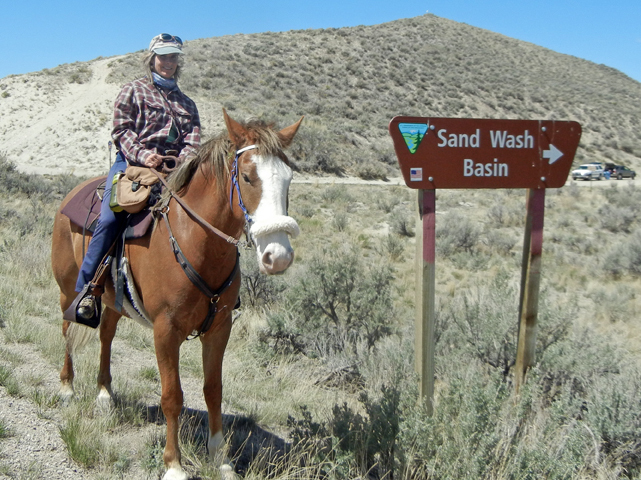 In November 2011, she started the Sand Wash Basin Wild Horse Club, a local group of volunteers dedicated to protecting, preserving and honoring the wild horse heritage for future generations. — Volunteers are welcome to camp the night of the 15th. For more information, call Nancy Roberts at 756-1978. Sand Wash Basin can mean different things to different people. For Craig resident Bernie Rose, the area is not only ripe for preserving Northwest Colorado’s wild heritage, but could also provide a unique opportunity to boost economic development in Craig and Moffat County. Rose is a member of the Sand Wash Basin Wild Horse Club, an organization that was started in November 2011 by Craig resident Nancy Roberts. Roberts has been documenting the wild horse herd at Sand Wash Basin since 2009, which includes 411 head, based on the most recent 2008 aerial census. The horses live in small family units, or bands. The horse club’s mission is to protect, preserve and honor the wild horse heritage, Roberts said. On Saturday, nine club members met at Downtown Books in Craig to finalize plans for the first clean-up day at Sand Wash Basin. The event is scheduled to take place at noon June 15 and 16 at Sand Wash Basin’s main entrance located at the junction of Colorado Highway 318 and Moffat County Road 67. The effort is being conducted in conjunction with the Bureau of Land Management’s Little Snake Field Office and will include an opportunity for volunteers to camp at Sand Wash Basin the night of the 15th. Roberts also expects there will be plenty of opportunities to view the wild horses. The wild horse club is still in its infancy, Roberts said, and the group plans to model itself after the Grand Junction nonprofit organization Friends of the Mustangs. The group plans to file for 501 (c) 3 status with the state by the end of the year, but in the short-term the wild horse club is looking for volunteers, new members and a local resident interested in serving as treasurer on the board. The board meets monthly at Downtown Books, 543 Yampa Ave. The next scheduled meeting takes place at 5 p.m. June 20 and all meetings are open to the public, Roberts said. For more information, visit http://www.sandwashbasinwildhorseclub.org or call Roberts at 756-1978.